Located in the Tool > Deformation sub-palette, these sliders evaluate the mesh’s creased edges or PolyGroups. When applied, ZBrush will polish the whole surface while maintaining PolyGroup borders or creased edges. With the small circle toggled closed, ZBrush will maintain the overall shape and vol­ume of the mesh without shrinking. With the small circle open, ZBrush will use more aggressive smoothing. You will see some surface volume changed. The original mesh is shown on the left. The result after using Polish by Feature is shown on the right. Note: As with all other deformations, Polish by Feature can be restricted by masking part of the model. This powerful feature has a modifier setting in the form of a small circle. With the circle closed, ZBrush will maintain the overall volume of the mesh while polishing based on the surface’s PolyGroup borders. If the circle is open ZBrush will still polish based on PolyGroup border but the overall volume will not be maintained and the mesh will likely contract. This powerful feature has a modifier setting in the form of a small circle. 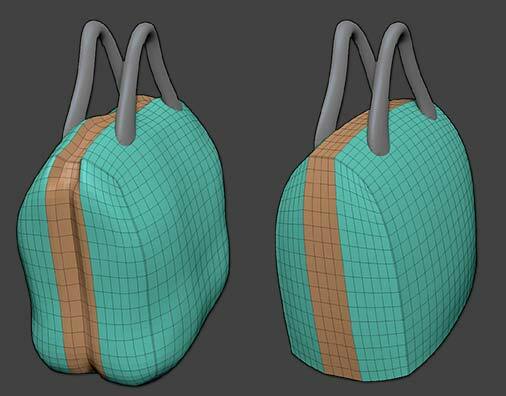 With the circle closed, ZBrush will maintain the overall volume of the mesh while polishing based on Creased Edges. If the circle is open ZBrush will still polish based on Creased Edges but the overall volume will not be maintained.